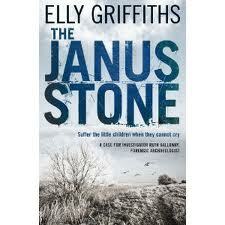 Keen to know what happened to forensic archaeologist Ruth Galloway after the end of Elly Griffiths’ crime début The Crossing Places, I started reading the second instalment in her story, The Janus Stone, straight away. Much as I did with The Crossing Places I raced through The Janus Stone, in which Ruth is called into determine the age of a child’s skeleton unearthed beneath a house with a chequered past. This time, however, things are further complicated by Ruth’s unexpected pregnancy, the result of a one-night-stand with Harry Nelson, the gruff (and happily married) DCI in charge of the case. Much as I enjoyed The Crossing Places, there were plot elements that I found faintly ludicrous, and I must say the same applies (perhaps to a slightly lesser extent) here. The story follows much the same formula as its predecessor – bones are discovered, Ruth helps Harry in his investigation along with a supporting cast of recurring characters, Ruth ends up in jeopardy as a result – but it’s all good fun. There’s dark creepiness aplenty and a few shocks, but don’t come to these books looking for gritty realism. There’s a touch of pantomime about the character eventually revealed as the villain, and it all gets a little bit Hammer Horror in places. Ruth and Harry’s relationship – now platonic – remains convincing, and Harry manages to remain largely likeable despite being a man who has cheated on his wife. His slim, attractive hairdresser, that Griffiths could lazily have depicted as a airheaded cow, is in fact intelligent, kind and interested in the arts, a wise choice on the author’s part as it stirs up all sorts of conflicting emotions for not just Harry and Ruth (who, while fond of each other, are in many ways profoundly unsuited to one another) but also the reader. However fond you are of Ruth, it’s hard to want Harry’s apparently happy marriage to end. Several more characters return to The Janus Stone from the previous book, most of whom are welcome. I could live without Ruth’s flighty friend Shona, who strikes me as something of a stereotype and contributes little, but the rest of the cast – as I tend to think of them; these books do have the feel of a quality TV crime drama – are three-dimensional and engaging. The setting isn’t as richly described as it was in The Crossing Places, but I should be fair and point out that in The Crossing Places the geography was integral to the plot, which isn’t the case here, so that’s probably to be expected. Once again, then, a gripping if unlikely story, a bit of Roman mythology thrown in, some genuinely funny observations, and characters I wanted to greet like old friends. I’ll be saving the next book in the series for a rainy afternoon or perhaps a long journey, rather than getting stuck in straightaway, as for me the recurring plot structures and characters won’t benefit from being read in quick succession, but I’ll certainly be continuing to follow Ruth’s progress. My next read? Um... a young adult novel about teen bullying and witchcraft. I'm not really looking for depth in my reading at the moment, am I? Stay tuned for my review of James Dawson's Hollow Pike, a book I may have to pretend to be 15 to get my head round.